Meet Winter and friends. 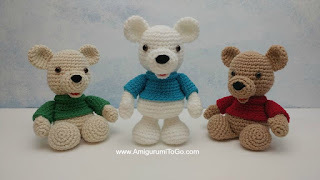 You can make these bears in any color combination. I crocheted the Polar Bear with White/Opal Comfort yarn by Red Heart. It actually has a sparkle to it and is very pretty. It reminded me of snow which is why I named him Winter. 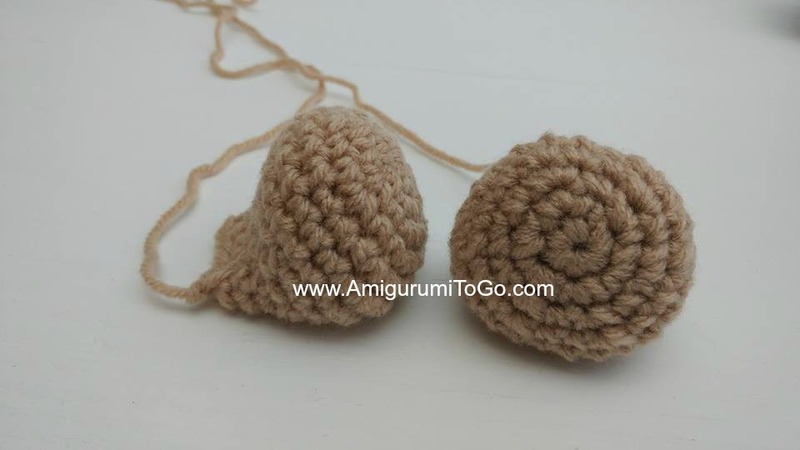 The other 2 were made with the same brand of yarn. They are approximately 8 inches from bum to top of ears in a sitting position. I'm sure he would have fallen over if breathed on. It will also depend on how the feet are shaped when stuffed. There's a winter hat pattern too! Click here for the Hat and Scarf pattern. worsted weight yarn in one color for the bear and one color for the sweater. I didn't measure out how much yarn per bear but I used less than half a package with 364 yrds. 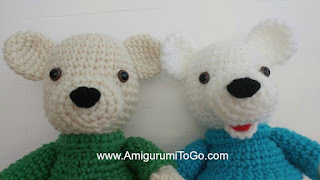 For the Polar Bear the eyes went in between the 9th and 10th row with 7 visible stitch holes between them. 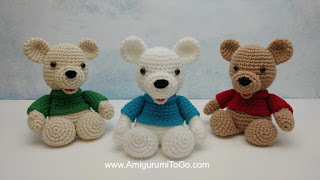 The other 2 bears went lower in between the 10th and 11th row with 6 stitch holes between them for the one with the red sweater and 7 visible stitch holes between them for the one with the green sweater. cut free from the head color, crochet around the color yarn tail in the next row to hide it. stuff the majority of the head. You can stuff more after row 26. Stuff more into the head now and shape the head as you stuff. Fold the last row of the sweater back to expose the loops inside, insert yarn into a loop and ch1. The ch1 counts as a st.
stuff the majority of the body. You can stuff more over the last couple rows. stuff and shape the body. f/o leaving a tail for sewing. Weave in and out of the remaining stitches then stuff the body more if needed. Make sure to shape the body as you stuff. 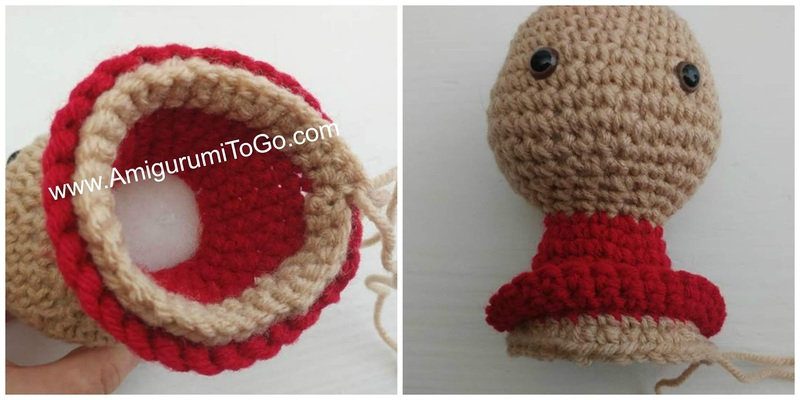 Once done, pull yarn tail tight to close up the body, knot off and hide yarn tail inside body. Whip stitch a nose in by bringing the yarn from the inside and out through the center hole of row 1, then wrap the yarn over the 1st and 2nd row multiple times until you have the size of nose you want. The mouth and tongue are optional. 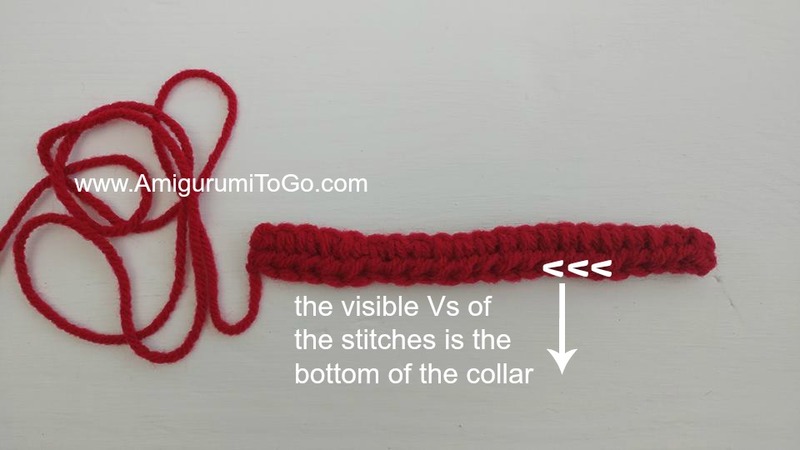 Sew the tongue to the straight edge of the mouth, on the surface. The front of the tongue should be free of stitches. 6-14) 1sc in each st for 9 rows. stuff the arm up to row 8, do not stuff the rest of the arm or it will make it too bulky for sewing. f/o and tuck yarn tail inside arm. sl st next st and f/o leaving a tail for sewing. Bring the yarn tail out between the 1st and 2nd row, pull the bottom of the sleeve back into shape then knot off yarn tail. You will use this yarn tail to sew the arm in and also to sew the sleeves to the body. Push the arms into the sleeves. The sl st on the last row of the sleeves should be sewn towards the body and is the same side you sew the arm to. Use the tarn tail from the sleeve to sew the arm inside. Knot off then leave the yarn tail for sewing to the body. stuff foot to row 8 only, do not stuff leg. 12) 1sc through both sides across to close up the leg. *For standing legs, do not close up the edge, instead add another row of sc and then stuff to the top of the leg. f/o leaving a tail for sewing. Squish the stuffing around in the foot to shape it. 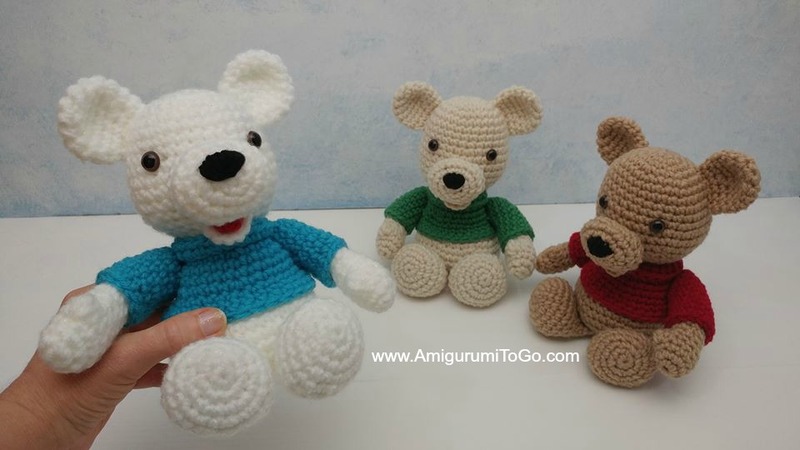 They should look as pictured before sewing them to the body. 1) Wrap the collar around the neck and whip stitch the 2 ends together. 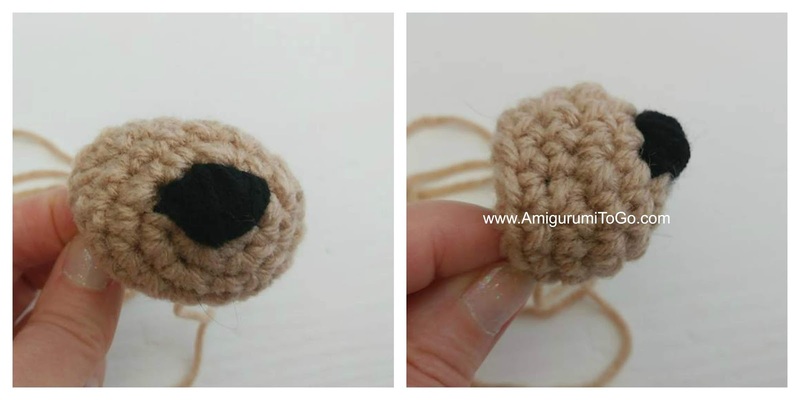 Hide the yarn tail inside the body. 2) Sew the muzzle on, you can partially stuff then stuff the remainder once the majority has been sewn to the face. The top of the muzzle should be sitting in between the 11th and 12th row, the bottom in between the 15th and 16th row. You can pin the muzzle in then sew around. 3) If you chose to make the mouth, sew it centered under the muzzle. The sides of the mouth can be sewn directly to the muzzle. 4a) For the sitting bear, sew the legs to row 7, just under the body. If the legs fall when you pick up the bear then add a holding stitch on each side to keep the legs in a sitting position. 4b) For a standing bear, sew the legs under the body, pin them in place first to sew how much distance is needed between them. See the 2nd photo at the top of this page for photo of the standing bear. 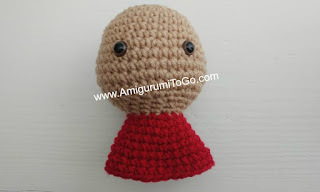 5) Sew the arms on, the top of the arm under the collar and on a slant. The top of the sleeves should look as pictured below, they are sewn quite far back. This helps the arms sit just so. Add a few holding stitches under the arm, tacking them to the body, so they don't stick out too far. 6) Sew the ears on, the top corner sewn in between the 4th and 5th row and the bottom in between the 9th and 10th row. Beautiful as always. I have a niece that is obsessed with polar bears and this would be a great Christmas gift for her. Even have some bear noses I can use with the safety eyes. Bless you and yours during the holidays. Thanks for your work.